Author(s): Ihcen Khacheba, Laboratory of Fundamental Sciences, University Amar Telidji Laghouat,, Algeria	Hadjer Boussoussa, Amar Djeridane, Abir Bekhaoua, Noussiba Bensayah, Mohamed Yousfi. 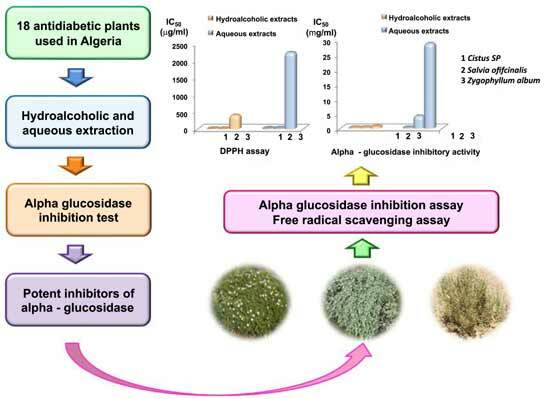 Objective: In the present study aqueous and hydro -alcoholic extracts of eighteen medicinal plants, collected in the town of Laghouat in the steppe region of Algeria, and which are used in the treatment of diabetes, were examined for α-glucosidase inhibition using an in vitro model. Also total phenol content and antioxidant activity of the extracts was investigated. Methods: The extracts were prepared using distilled water and hydro -alcoholic solvent (methanol/water). The amount of total phenolics and flavonoids in the samples was determined with the Folin-Ciocalteu reagent and with aluminum chloride respectively. To identify plants with inhibitory capacities, we have studied the effects of ours extracts on the kinetics catalyzed of α-glucosidase an enzymes belonging to the class of hydrolase responsible for the digestion and we have subjected our extracts to inhibition assay to determine the inhibition percentage for each extract. Finally, we assessed the potential antioxydant of the best inhibitory plants with the DPPH test. Results: The major plants were found to inhibit enzymatic activity of α-glucosidase and the values of the IC50 constants have been determined for the best inhibitory plants common in both extraction methods (Cistus SP, Salvia officinalis and Zygophylum album), with values ranged from 0.38 to 28.95 mg/ml. The evaluation of antioxidant activity of this plants using DPPH test, shows that the phenolic extract of Salvia officinalis exhibit good antioxidant capacity (8.46 μg/ml) comparatively to the antioxidants taken as reference (BHA, Gallic acid, Rutin, Trolox and Vitamin C). Conclusion: This study is the first report on potential inhibition of these plants extracts on the digestive enzyme, α-glucosidase. The obtained results support the traditionally use of a number of the analyzed species in the in the management of diabetes. Keywords: Antioxidant activity, diabetes, enzyme inhibition, phenolic compound, α-Glucosidase. Keywords:Antioxidant activity, diabetes, enzyme inhibition, phenolic compound, α-Glucosidase.